The campground was nice and clean. The employees were super nice. The campground is really close to everything and is easy to get in and out of. We had a pull thru spot and it had plenty of room for our 38" bumper pull. The only downside of the stay was the restrooms. They were really dirty and old. I would stay here again even with the bathrooms. We made reservations for 5 days before Memorial day weekend and found that we couldn't get in anywhere else in our route. These wonderful people made a space for us where they re-did the sewer hook up and graveled and leveled a pad for us. We ended up staying an additional 5 days and had a wonderful time. The campground is very big and the sites are nice and big. The facilities are really good also and the staff are very accommodating. In spite of us being ill part of the time, these people helped to make our stay really great. Ok park, close to park as in the middle of it almost. Quite rural atmosphere, wooded and not much else to say. Nice people but nothing special here so it does not realy stand out as a destination park if you have children or are looking for that relaxing hot tub. Give it a four mainly for location and quite. This is a super RV park. It has mostly level sites, is well shaded, has useable picnic tables and fire rings, The restrooms are small but clean. The laundry was adequate. The park is very pleasant and family friendly. It is close to the National Park. The Gettysburg Diorama was enjoyable and informative. The Office/Store is friendly and has ice and souvenirs! We would most certainly recommend this park for either a "home base" or as a vacation spot. Seems ALL Good Sam Parks have the friendliest people! As others have said a nice family campground very near the National Park. That said you really want to have transportation with you as biking is rough up and down hills unless you are fit and strong. Enterprise Rental will come and pick you up if you need a car. One negative thing is hwy 134 which is the only hwy you would bike or walk down to the park from the campground. It is VERY dangerous and narrow with no lane for biking or walking so BE careful if you want to do that. If you are into horses they have them here for tours etc. Lots to do for the young kids, putt putt, swimming, basketball, volleyball etc. If you are planning on visiting Gettysburg, this is a great place to stay (sites are rough gravel and many un-level) but bring transportation or plan on renting some. Location is perfect for exploring Gettysburg. Gravel roads with mostly level sites. Nice small store on site. Laundry facility was good. Multiple amenities especially for campers with children. Very close to Natl Park, staff extremely helpful for sightseeing. Clean park. Laundry facilities too small for this park. Rv sites very close together. Crowded roads with little area to park vehicle. Interior roads dirt & gravel with pot holes. Easy park to walk & exercise. We got the last spot in the campground due to the fact that we had reserved it so late. We were right on the main road and there was a lot of traffic, which was to be expected. 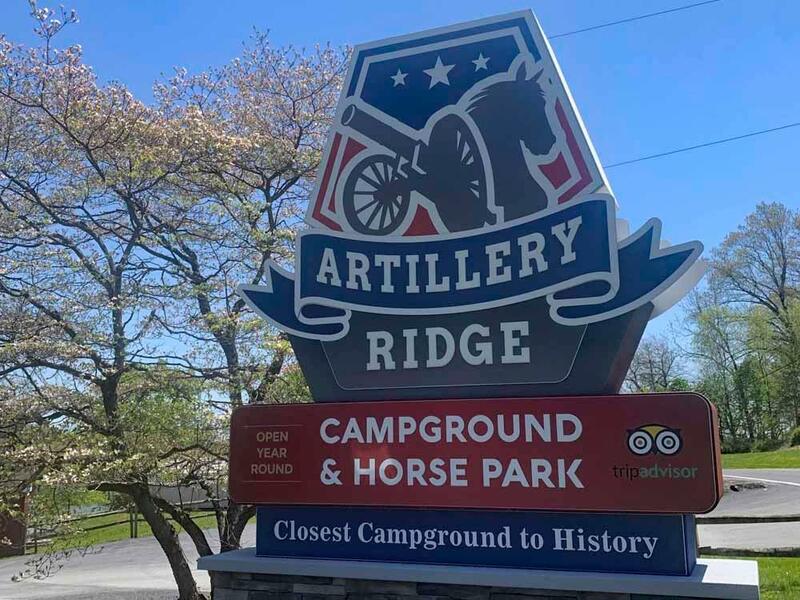 It was not that a big of a deal to us as we were more interested in touring the battlefield and going to attractions outside of the campground. 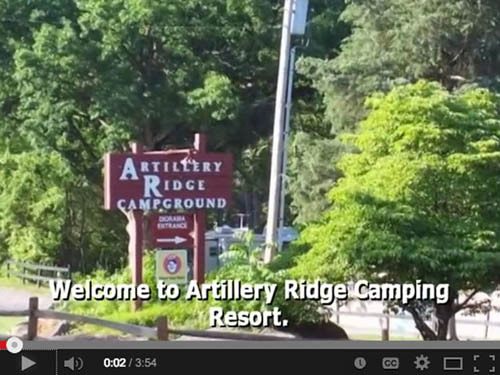 The campground is conveniently located to the battlefield and the many shops and restaurants. The amenities of the campground were very nice, staff were very friendly. Overall, it was a very nice stay. We have stayed here many times. I love it here. Its simple to get to, very easy to get set up in your sites, which are pretty level as a whole. Its a large park, convenient to EVERYTHING in Gettysburg. Very Fairly priced, and they actually accept Good Sam (Most campgrounds always have a "special weekend" and they don't accept the GS discount) I recommend this campground. Campground location is convenient to all Gettysburg Attractions. Employees were very pleasant and helpful. The campsite grass was not mowed and was very high for a holiday weekend. The free wifi only seemed to work when you go to the campground website. The location is PERFECT…about a mile from the Gettysburg National Military Park entrance and about 2 miles from town. Sites are gravel and must use leveling blocks; fairly large with grass/gravel mixture, many are pull-through. Each site has a picnic table and fire ring; some have shade trees, some do not. Bathrooms are in need of an update. Women’s shower was relatively clean but there was hair in the shower drain. My husband said the men’s was disgusting, as if it hadn't been cleaned for a long while. The campground has some long-term residents. The grounds are mowed but no landscaping. There is a paved basketball court, three horseshoe pits and a horse stable for those traveling with horses. Nothing fancy so price seems high at $58.00. Many discounts are accepted and price reduces about $5.00.